Is it Time for a Combi-Boiler? Have you been thinking about updating your traditional boiler and hot water heater to a tankless combi-boiler? Last week, one of Fox Plumbing & Heating’s professional plumbers, JP added a great new Navian Combi-boiler system to a Seattle home. 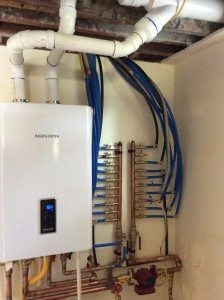 These high efficiency tankless condensing combination boilers are able to keep your home warm and provide hot water in an all-in-one system. 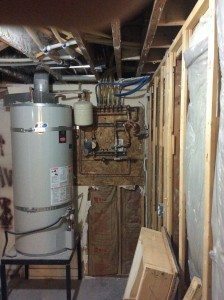 The unit that JP installed will be able to create enough hydronic heat for an entire home. It will be able to run two showers and a dishwasher, all at the same time. And right now Fox Plumbing & Heating will take $500 off the installation of a premium Navian Combi-boiler when you purchase and have it installed by Fox. Fox Plumbing & Heating offers a number of tankless water heater and combi models that are able to meet all your Seattle and King County water and home heating needs. These high efficiency tankless models save money on installation time, reduces call backs and takes up 80% less space than a traditional floor standing boiler and hot water tank heater. So you save money on the install, and you save space on how much room these units take-up. Did we forget anything? Oh yeah, we forget to mention that you’ll save a lot of money on your monthly water and heating bills! Because you’ll be shocked on how much money you save when switching to a tankless combi-boiler. In some cases, you’ll save over 40% on monthly costs for your home’s heating and water. If you're ready to upgrade your old furnace and hot water tank system to something new that saves you time, money and space then think Fox.